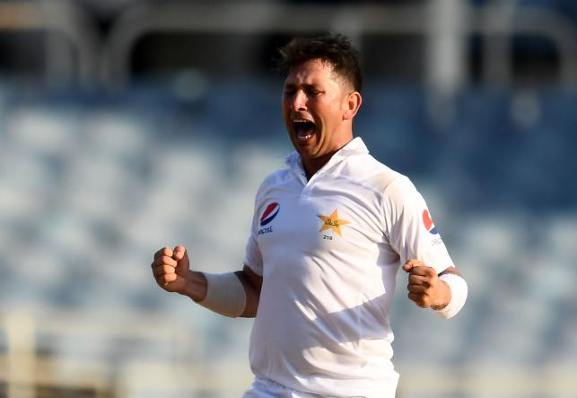 Yasir Shah ripped through the top order of the West Indies second innings in the final session of another long day to put Pakistan on course for victory at the end of the fourth day of the first Test at Sabina Park in Jamaica on Monday. After captain Misbah ul Haq became just the sixth batsman in Test history to be left stranded on 99 not out as Pakistan were dismissed for 407 in their first innings, the hosts, trailing by 121 runs, were reduced to 93 for four at stumps with Shah taking all four wickets. They go into the final day needing another 28 runs to erase the first innings deficit with the pair of nightwatchman, Devendra Bishoo and debutant Vishaul Singh, expected to be under immense pressure, especially from the rampant leg-spinner, when play gets underway on a wearing pitch on the final morning. Shah struck with his very first delivery, bowling Kraigg Brathwaite with a ball that skidded through on the opening batsman. He quickly added the scalps of newcomer Shimron Hetmayer and Shai Hope before finishing off with the important wicket of Kieran Powell, the opener taken at slip by Younis Khan for a well-played 49. That late drama was in contrast to the pedestrian progress through the first two sessions of the day as Misbah worked his team into a dominant position despite being left one run short of an 11th Test century. Last man and debutant Mohammad Abbas was trapped leg-before by Roston Chase on the stroke of the tea interval. In his usual phlegmatic manner, Misbah ensured Pakistan constructed their position of dominance via a succession of partnerships after they resumed on the fourth morning at 201 for four and facing the threat of the second new ball. Yet it was a far from a flawless effort as the West Indies extended their season of woe in the field, allowing the opposing skipper to escape when he should have first been taken at short-leg by Singh off Shannon Gabriel and then later on in the morning session by Alzarri Joseph running back at mid-off to the bowling of leg-spinner Bishoo. It was Bishoo who eventually broke an 88-run sixth-wicket stand between Misbah and Sarfraz Ahmed, the wicketkeeper batsman playing in his usual pugnacious manner in getting to 54 before he was bowled around his legs attempting a sweep shot just after lunch. During the course of his innings, Ahmed went past 2,000 runs in his Test career. Misbah achieved a milestone of his own when he notched his 5,000th Test career run before reaching the half-century mark and began to play an increasingly important role through the afternoon session as the West Indies emerged from the listless indifference of the first session to finally get among the wickets. Joseph removed Mohammad Amir and Wahab Riaz in quick succession to finish with three wickets in the innings, the same as fellow opening bowler Gabriel. When substitute fielder Jermaine Blackwood ran out Shah, Misbah was on 68 with the score at 373 for nine. However, Abbas displayed determination and discipline in surviving with his captain for 45 minutes while Misbah controlled most of the strike and edged towards the coveted century. Misbah’s innings spanned nine minutes short of six hours, during which he faced 223 deliveries, striking three sixes and five fours.